These are rare and precious oils. They are the soul of the plant. They are not a ‘product.’ To honor the wisdom of the spirit of the plant, we advise that you use them with respect and sparingly. One way to really commune with and learn from each oil is to anoint yourself. Anointing is an ancient practice. There are different ways to anoint and we will describe a few below. The Simple Anoint: Apply a drop of the oil to the inside of each wrist on the thumb side, where the pulse point is. One drop should be enough for both wrists. Then apply a drop to the area behind each of your earlobes. Again, one drop should be enough for both sides. If you want to smell the oil even more, you could rub the remains of the drop on your philtrum, which is the area between your upper lip and nose. As you anoint yourself, inhale with gratitude to receive the wisdom of the oil. Be mindful as you do this. You can set an intention before you anoint yourself and be mindful of the intention while you finish anointing. 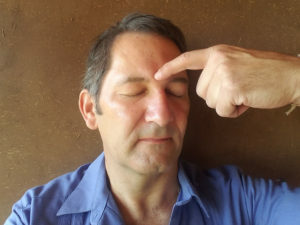 Another way to anoint, following an ancient Muslim practice of working with attars is to apply a drop each to a small cotton ball and place each ball in the helix of your ears. The helix is the ridge-like area just outside your ear canal. Sometimes this is only done on the right ear. yourself as often as you need. Even when the oil is in the bottle in your medicine bag on your body, it will continuously teach and inspire you. Carry the same oil for weeks or even months and listen to its teachings. particular area that needs more focused attention, you can flick your fingers in that direction. There are many other ways to use the oils that we will share in our blog.